« 4th Annual Purple Run! We invite you to join us for Safe and Sound, a night of great sound to benefit SafeHouse Center! Swing by LIVE Ann Arbor from 6-9:30pm to enjoy great music courtesy of DJ DC Productions, LLC, great drinks, and a great atmosphere. 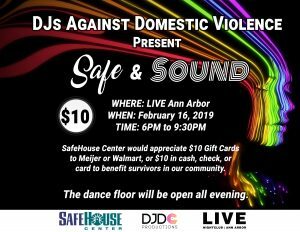 We ask that attendees donate a $10 cover that will go directly to SafeHouse Center, a nonprofit organization that supports survivors of domestic violence and sexual assault in our community. SafeHouse Center will be accepting donations in cash, credit card, check, or in the form of $10 gift cards to stores such as Meijer or Walmart!